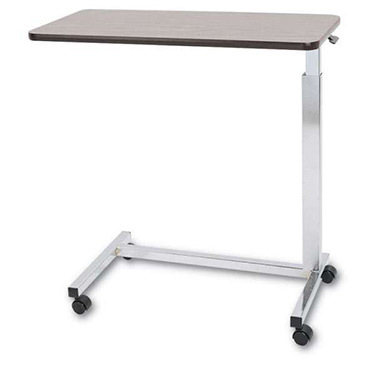 Medline Standard Overbed Table. Go with the classic if you need a dependable overbed table. The table top on our standard is constructed of wood grain melamine laminate with a flush-mounted T-mold edge. It will resist all sorts of damage, ranging from boiling water and food acids to ink spills and alcohol. Top measures 15.5"W x 28"L x 3/4" thick. Chrome-plated column and base are 16 and 17-gauge welded tubular steel for great strength. The standard U-shaped base has 24" of open space between the legs - perfect for use with most chairs as well as beds. This table will adjust in height from 28" to 45"; an automatic spring lift mechanism is built in to allow for easy and safe height adjustment. Equipped with 1 1/2" twin wheel casters for easy maneuverability over carpet, tile, and linoleum. Weight capacity: 50 lbs evenly distributed. Warranted for one-year. Walnut Laminate Top. I purchased this table for my 94 y/o mother, who resides with me. It meets all expectations. Arrived in 2 days. Very pleased! Pros:Seems good quality. Table nice size. Raises/lowers easily. Cons:Only con is extremely dufficult to roll on carpet. Just right item for my Dad. works well, happy with all its features.